The lipids are a large and heterogeneous group of substances of biological origin that are easily dissolved in organic solvents such as methanol, acetone, chloroform, and benzene. By contrast, they are either insoluble or only poorly soluble in water. Their low water solubility is due to a lack of polarizing atoms such as O, N, S, and P.
Lipids can be classified into substances that are either hydrolyzable— i.e., able to undergo hydrolytic cleavage—or nonhydrolyzable. The simple esters include the fats (triacylglycerol; one glycerol + three acyl residues); the waxes (one fatty alcohol + one acyl residue); and the sterol esters (one sterol + one acyl residue). The phospholipids are esters with more complex structures. Their characteristic component is a phosphate residue. The phospholipids include the phosphatidic acids (one glycerol + two acyl residues + one phosphate) and the phosphatides (one glycerol + two acyl residues + one phosphate + one amino alcohol). In the sphingolipids, glycerol and one acyl residue are replaced by sphingosine. Particularly important in this group are the sugar-containing glycolipids (one sphingosine + one fatty acid + sugar). The cerebrosides (one sphingosine + one fatty acid + one sugar) and gangliosides (one sphingosine + one fatty acid + several different sugars, including neuraminic acid) are representatives of this group. The components of the hydrolyzable lipids are linked to one another by ester bonds. They are easily broken down either enzymatically or chemically. The hydrocarbons include the alkanes and carotenoids. The lipid alcohols are also not hydrolyzable. They include long-chained alkanols and cyclic sterols such as cholesterol, and steroids such as estradiol and testosterone. 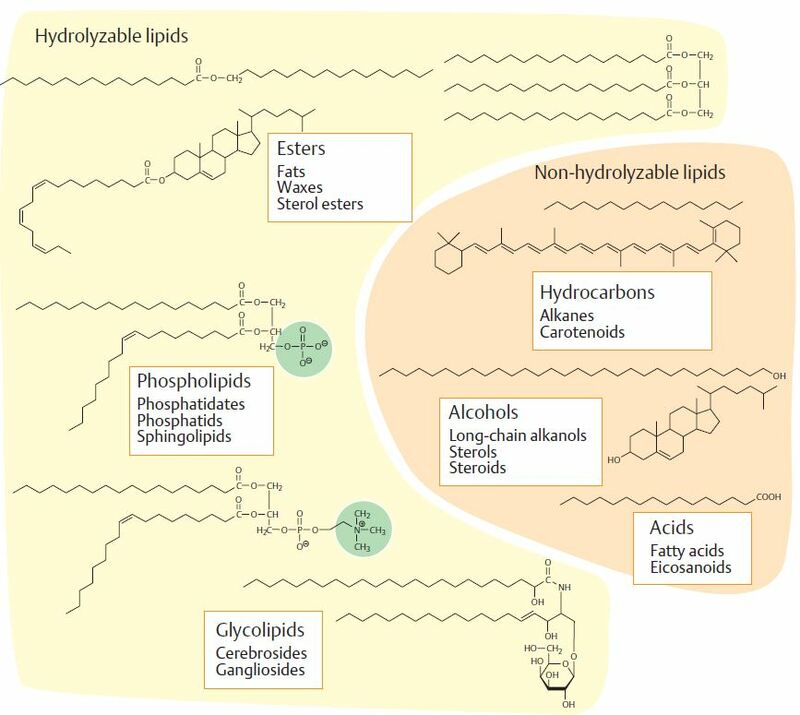 The most important acids among the lipids are fatty acids. The eicosanoids also belong to this group; these are derivatives of the polyunsaturated fatty acid arachidonic acid. Fatty acids are long-chain monocarboxylic acids. As a consequence of their biosynthesis, fatty acids generally contain an even number of carbon atoms. The general formula for a saturated fatty acid is CH 3 (CH 2 ) n COOH, in which n in biological systems is an even integer. An example of an unsaturated fatty acid is the 18-carbon unsaturated fatty acid oleic acid. In the case of unsaturated fatty acids, there is at least one carbon-to-carbon double bond. Because of the double bonds, the carbon atoms involved in these bonds are not “saturated” with hydrogen atoms. The double bonds found in almost all naturally occurring unsaturated fatty acids are in the cis configuration. Glycerides are lipid esters that contain the glycerol molecule and fatty acids. They may be subdivided into two classes: neutral glycerides and phosphoglycerides. Neutral glycerides are nonionic and nonpolar. Phosphoglyceride molecules have a polar region, the phosphoryl group, in addition to the nonpolar fatty acid tails. The structures of each of these types of glycerides are critical to their function. The esterification of glycerol with a fatty acid produces a neutral glyceride. Esterification may occur at one, two, or all three positions, producing monoglycerides, diglycerides, or triglycerides. 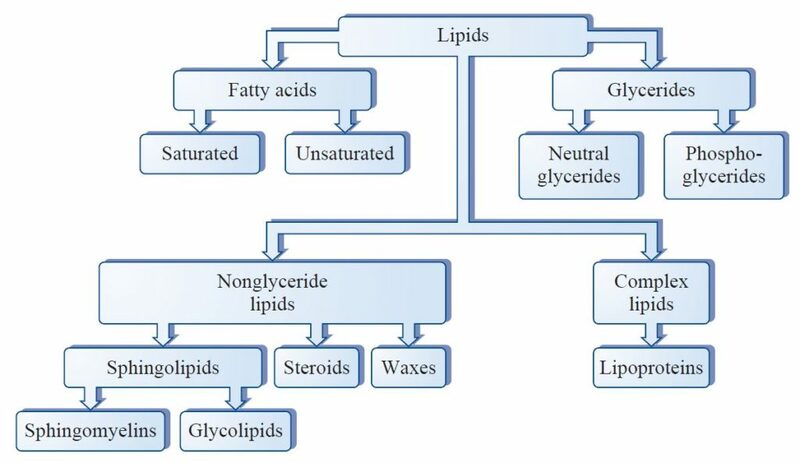 Although monoglycerides and diglycerides are present in nature, the most important neutral glycerides are the triglycerides, the major component of fat cells. Phospholipids are a group of lipids that are phosphate esters. The presence of the phosphoryl group results in a molecule with a polar head (the phosphoryl group) and a nonpolar tail (the alkyl chain of the fatty acid). Because the phosphoryl group ionizes in solution, a charged lipid results. The most abundant membrane lipids are derived from glycerol-3-phosphate and are known as phosphoglycerides. Sphingolipids are lipids that are not derived from glycerol. Like phospholipids, sphingolipids are amphipathic, having a polar head group and two nonpolar fatty acid tails, and are structural components of cellular membranes. Steroids are a naturally occurring family of organic molecules of biochemical and medical interest. The steroids are members of a large, diverse collection of lipids called the isoprenoids. All of these compounds are built from one or more five-carbon units called isoprene. Waxes are derived from many different sources and have a variety of chemical compositions, depending on the source. Paraffin wax, for example, is composed of a mixture of solid hydrocarbons (usually straight-chain compounds). The natural waxes generally are composed of a long-chain fatty acid esterified to a long-chain alcohol. Because the long hydrocarbon tails are extremely hydrophobic, waxes are completely insoluble in water. Waxes are also solid at room temperature, owing to their high molecular weights. Two examples of waxes are myricyl palmitate, a major component of beeswax, and whale oil (spermaceti wax), from the head of the sperm whale, which is composed of cetyl palmitate. Complex lipids are lipids that are bonded to other types of molecules. The most common and important complex lipids are plasma lipoproteins, which are responsible for the transport of other lipids in the body. Lipids are only sparingly soluble in water, and the movement of lipids from one organ to another through the bloodstream requires a transport system that uses plasma lipoproteins. Lipoprotein particles consist of a core of hydrophobic lipids surrounded by amphipathic proteins, phospholipids, and cholesterol.